The Strokes are set to release their newest single, “Under Cover Of Darkness,” on February 9th via a stream on their website. The song will be available to download for free for 48 hours from www.thestrokes.com , and will arrive at radio on the same day. “Under Cover Of Darkness” will be available to purchase digitally in the US via iTunes on February 15th. The song will be available from the band's website, Thestrokes.com, from 7:35pm (GMT). It will be available to download for 48 hours. The track will also be released as a limited-edition seven-inch vinyl single on April 16, Record Store Day. 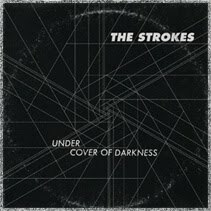 'Under Cover Of Darkness' is the first song to be taken from The Strokes' new album, 'Angles', which is out on March 21. It'll be the New York band's first album since 2006's 'First Impressions Of Earth'. This is the first time in a long time that I have been this excited about a single song release. I am a huge Strokes fan and from the 30 second snippet I heard the other day I was drooling at the sound of Under Cover of Darkness. This could be The Strokes year at return to greatness. We shall see but make sure you get to their website tomorrow and pick up the free download. Remember it is only available for 2 days so don't forget. I will send out another reminder tomorrow as well.